Happy Curious: My DIY Kawaii Bento! Many a chef would tell you that people eat with their eyes first so food has to be plated to look appetizing. For home cooks who live a busy lifestyle however, that may not always be the case. But it is undeniable that visual appeal do influence us to try out something new. So I experimented with making my food pretty by arranging it like a bento. 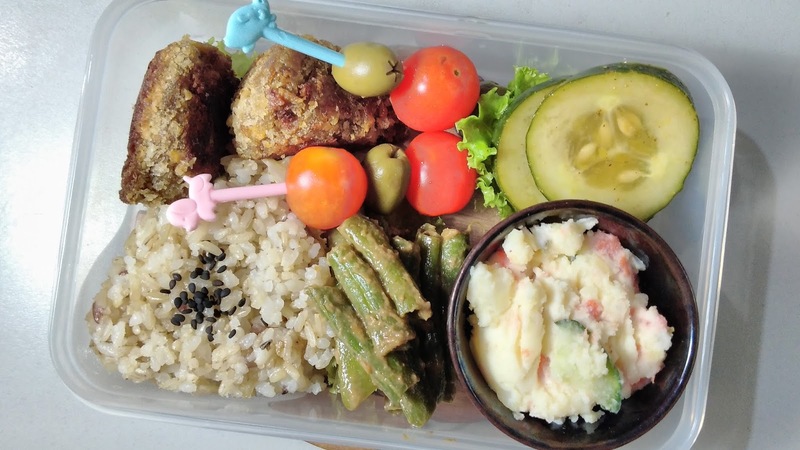 If I can make this bento cuteness for lunch, you can too! The Japanese lunch box or bento is one way of preparing and arranging food on your container so it still looks appealing. Japanese moms have been making these for their kids at school to encourage them to eat a variety of foods to ensure that they get their much-needed nutrition. They make them look so cute and pretty that even adults love them, me included! So I made one for myself with a few, simple items. The basic trick to making a bento is to have all your food prepared ahead of time. So I cooked and prepared my main dishes as well as my salad and some items that I can use to decorate. In this case, I cooked my Potato + Tofu Croquettes and made my potato, carrot and cucumber salad. I also boiled some Baguio beans and marinated it in brown sugar, miso and soy sauce. There were also some pickled cucumbers and olives. I also bought some cherry tomatoes which I knew would look good as decoration. For the rice, I usually cook a big batch and put them in individual containers. I just reheat them by warming them up in a non-stick pan without any oil; just moving them around as though I were making fried rice. If you are really into making a bento regularly, then I suggest you also invest in some tools and equipment such as a rice molder, sauce containers and some plastic toothpicks which can be reused. I also invested in small bowls that can fit in a lunch box. Of course, you also have to get yourself a cute bento box but almost any lunch box will do. For dividers, you can use lettuce leaves or wax paper or even foil. But if your food is mostly dry, you may not need dividers. Silicon muffin molds are also a good way to divide the food in your bento as they are flexible and can fit into different-shaped bento boxes. To make my bento, I reused a clear, plastic container that they use for takeouts. I just washed it and dried it and arranged my food to fit in the container. I reheated my brown rice and formed it into a triangular shape and placed it on my container. I sprinkled some black sesame seeds on top for decoration. Beside it, I placed 2 pieces of the croquettes. On the other side of the rice, I arranged some of the beans. In a small bowl, I placed the salad. I tore off a portion of a lettuce leaf and used it as a bed for a couple of pickled cucumbers. Finally, I skewered together olives and cherry tomatoes and placed it on the gap between the croquettes and the cucumbers. I had to slant the skewers so they fit inside the container when I put on the lid. Make sure your container is deep enough to hold all your food but not too deep that it would be difficult to get to your food when it's time to eat. I did have a banana as my fruit for this bento but I didn't get it in the picture. I have been making lunch boxes for myself for some time now but I never really invested in bento knick knacks before. I have bought myself some bento stuff since so now I am able to do some edible decorations or side nibbles. This was my first attempt at making my bento look cute and I am so happy about it. I did research on how to make a bento and here are some of the things I've learned and keep in mind, whenever I make myself a kawaii bento or any of my not-so-kawaii lunch boxes. Proportion is key. Ideally, food should be portioned in the following ratio for kids: 4:2:1:1. This means 4 for carbohydrates, 2 for protein, 1 for vegetables and 1 for fruits. For adults, you can adjust this to your eating plan (if you have one). For example, if you are eating low carb, then you can substitute the carbs for more veggies instead. Incorporate different colors in your food. This is to ensure that you eat a variety of food to give you adequate nutrition. You need to have these colors in your lunch box: white, black/brown, red, yellow/orange, and green. Let everything cool down before sealing. Make sure that all your warm foods have cooled down to room temperature before snapping the lid unto your lunch box. This ensures that your food will not spoil from the extra moisture and condensation from the hot food. Pack everything tightly. To ensure that your bento still looks the same way you arranged it when you eat it, pack everything tightly. Use extra veggies like cherry tomatoes, steamed broccoli, green peas, corn, etc. to fill-in the gaps. Use separate containers for wet food. You can use lettuce leaves or wax paper as dividers for dry foods or you may not even need dividers at all. For foods that are wet or have sauces that might drip to other food items, put them in their own container like I did with my salad. This is also a good way to separate the warm food from the cooler ones such as salads and fruits. You would need a separate container for soups. Finally, an important tip is to have fun making it. Making a bento is not only to ensure that you are able to fully enjoy the food you love but also a way of expressing your creativity. I'm sure you've seen some of the pretty and amazing bento creations online and I know mine fails in comparison. I'm not even at the stage of making smiley faces with nori or making anime character faces on my rice. I doubt I'll reach that stage but I'll just strive for cuteness, or at least a visually appealing organization/arrangement of my food for my lunch boxes. A bento is also a great way to encourage kids to eat their veggies. With a bit of preparation, the busiest of us will be able to enjoy this process. You won't only have a tasty, nutritios and great-looking lunch; you'll have a conversation piece too!